The 16th-century French doctor Michel de Nostradamus, and his obscure yet hypnotic prophecies, have cast their spell on the world over the last four-and-a-half centuries. He has become a wellspring for wisdom and waggishness for a broad range of diverse historical figures and colorful characters. He is a brunt of jokes by Jay Leno of NBC’s Tonight Show and was the theatrical device of a cigar-waving Orson Welles, giving one of his better melodramatic performances as the host in a documentary, uttering facts, fables, and smoke rings as captivating and cloudy as Nostradamus’ own writings. Nostradamus has been the inspiration for something as benign and silly as the Nostra Doormouse of holiday cards, while others exploited his prophecies for deadlier purposes. Josef Goebbels used the prophecies of Nostradamus as a Nazi propaganda weapon during World War II, while Britain’s legendary prime minister Winston Churchill retaliated with his own platoon of interpreters, until even Louis B. Meyer, the movie mogul of MGM Studios, put Nostradamus on the silver screen in his film shorts to boost American morale. Today, many dismiss Nostradamus as a freak of urban legends and reject his interpreters and avid students as victims of another reconstituted alluvium of New Age sewage. Nonetheless, he has had (and still has) millions of admirers and defenders. Some of them were kings and queens of France, including such rulers as Henry IV, Louis XIII, Louis XIV, and Emperor Napoleon’s wife–the Empress Josephine. Respected literary giants such as Victor Hugo have tried to decipher him. World leaders have invoked his name to change destiny. Nostradamus and his prophecies just won’t go away. At the moment when it seems as if the tangle of biographical fact and myth about the man and the chaos of his cryptic prophecies should drive one away, lightning bolts of what appear to be prescient genius cut through his nebulous narrative of tomorrow. Was Nostradamus a fraud or a true prophetic savant? One thing is certain: it is safe to say that the man who launched the Nostradamian phenomenon has made good on at least one of his 1,500 or more predictions–that greater and lingering fame would come after his death. Indeed, after his passing in 1566, his “afterlife” has made his name far more famous and enduring than when he was alive. It cannot be denied, even by his greatest debunkers, that Nostradamus is one of the best-known historical figures of the past millennium. When we, and the controversy of Nostradamus, entered a new millennium, many interpreters and dilettantes of Nostradamus mistakenly believed his prophecies foretold the end of the world–a strangely popular but patently unqualified myth, since Nostradamus had dated the end of the world 1,797 years ahead in the year 3797. Nevertheless, a peaceful turning of New Year’s Day 2000 exposed Nostradamus in the minds of many believers and skeptics as a prophetic failure and charlatan. Then on 11 September 2001, the debate about this man and myth came back before global scrutiny. No sooner had the twin towers of the World Trade Center collapsed into billowing, apocalyptic clouds of debris, than Reuters News Agency broadcast across the planet a prophecy attributed to Nostradamus about “hollow mountains” falling in the “City of York.” The lines of the purported prophecy–much like what we know about the man Nostradamus–were a blend of myth and fact. Fake lines like “the city of York” drew people in, yet these were sewn together with stolen lines of two actual Nostradamus prophecies–the same prophecies that for decades many interpreters, including this author, believed forecast a future nuclear or terrorist attack on New York’s lower Manhattan financial district. When you have two prescient-sounding yet general provocations that include images like “fire approaching” a “new city” at “forty-five degrees latitude” in the “path” of “hollow mountains” near a “garden of the word,” the hackles can rise–especially if you apply present-day facts to conveniently join together the dots of a 450-year-old prophetic rant to see what you want to see. Does one brush it all off as a coincidence that the city of “new” York is near latitude 45 degrees, or that the first Boeing 757 hijacked by terrorists cut into the North Tower of the World Trade Center in “a huge, scattered flame” at a 45-degree angle? Is it just the law of chance fooling a prophetically sympathetic mind when the second hijacked airliner passed over New Jersey (also known as the “Garden” state) and swerved at high speed toward the South Tower of the “world” Trade center building exactly over the “Path” subway tunnel before slamming into the second man-made peak of “hollow mountains”? And when Nostradamus describes his vision of “hollow mountains” being “seized and plunged” into a “boiling cauldron,” are we conned yet again by a new generation of sycophants tagging events of their time on to cryptic ravings; or is it more than a coincidence that each tower as it fell looked as if it were seized by the hand of an invisible force and plunged into the boiling cauldron of its own debris cloud? Are the “Normans” some retroactive allusion to the people of Normandy, or is this, as Nostradamian scholars believe, a code name for the French, whose intelligence agents on 10 September were indeed frantically warning their opposites in Washington D.C. that a terrorist attack on America was imminent? Do we have a 16th-century charlatan catching us in our projections when the multiple meanings of Renaissance French can satisfy what we want to see? The word Nostradamus uses for “cauldron” is cuue (spelled cuve in Modern French). It can mean a number of things beyond “cauldron” such as “tank” or “tub.” Is the skeptic right when he brushes off any application of this word to the fall of the twin towers? Is the skeptic right to suggest waggishly that we might as well say Nostradamus is predicting some future disaster in a jacuzzi; or, is it not a little disturbing to one’s flippant reason to discover that the World Trade Center was built on a huge, rectangular cement box of watertight floor and walls known as “the tub”? It could be said that Nostradamus the man planted the seed of Nostradamus the Myth in April of 1554 (on Friday the Thirteenth, no less) when it is believed his secretary began transcribing his bizarre history of the future. 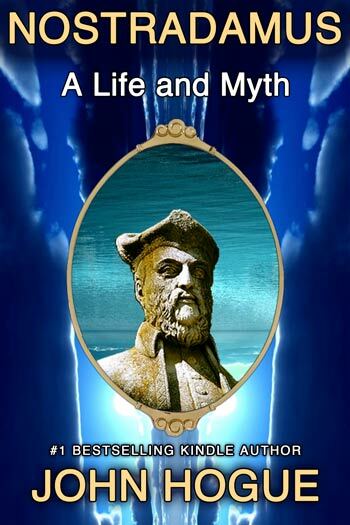 The Myth was born 12 years later, in 1566, when family and friends lay his lifeless body behind the wall of his favorite chapel outside of town. Ever since that day, Nostradamus has enjoyed an afterlife. In life, he painstakingly manufactured a literary chaos that would turn the cloudy quatrains and half-page-long sentences of his prophetic prose narratives into a tabula rasa upon which each generation of interpreters could project their hopes, fears, and expectations. Moreover, for centuries now, biographers, blind believers, debunkers, and “prophegandists” have helped it along, with accurate and inaccurate dissemination of his prophetic legacy. In the process the man and his life has all but disappeared in the giant shadow cast by his own controversial prophecies. So just who was Nostradamus? The new millennium and the “9/11” attacks have sparked the greatest debate yet about the efficacy of this man and his prophecies. There could be no better time to release a book that reassesses what we know about Nostradamus, the man. The present book is the first complete and full-bodied biography and historical reassessment in over sixty years. This publication celebrates the 500-year anniversary of the birth of history’s most famous and controversial prophet. You’re so cool! I don’t believe I’ve truly read through a single thing like that before. So good to discover somebody with genuine thoughts on this subject matter. Really.. thanks for starting this up. This web site is something that is required on the internet, someone with a little originality! John, some questions abour Mabus. I think, as you, it is a word game as it was one of the basis of the codified sistem of writing of Nostradamus. In the anagrams, is posible to exchange the “a” with the “s”? In the anagrams it is possible that the last letter of a word can be actually the first? If it is possible (I don’t know rules of anagrams) we will find that Mabus become Amabu, and if we read the word to the reverse, it is Ubama. It is a joke beetwin Obama and Usama, telling us that Obama could be a terrorist. He took the place of Usama, killing him. Maybe there is a quartain that explains that. One information more: Audrey Tomason is the chief of counterterrorism of Ubama (Obama). She wrote a doctoral thesis called The equation of the apocalipsis were she explained the need of a genocide of 5.000 milions of human beings, saving of that devastation some people in special places (rich, nobel prices etc…as always…). That thesis now has been become secret in the Kennedy School of Politics. Maybe you know the letters that Albert Pike sent to Mazzini in the nineteen century. Those letters wold be (possibly) the general plan. The way for getting it would be the confrontation beetwin islam and christianism (catholicism, principally), ant the plan of contingencies would be the equation of the apocalipsis. It is only an hypothesis, but the coincidences are big for not taking, carefully, it in account. I dont know if you use to answer the comments, but if you do, I would be very glad of knowing your oppinion, and if you preffer it, you can answer to my e-mail. Thank you, and, as always, simplicity is the key. In india also, One great proficient is there, His name was Veera brahmendra swamy: The spiritual GURU. He also wrote many books about prophecy and the Future shape of the world.I think their mainly aspect is to express revolutions which will took part in future and a little they may succeeded. but, as like controverts said the end world they never wrote anything if they may be wrote any that all not correct. ?????? Can you write this comment again? Thanks.